Many times when you are painting, you will need to modify color intensity without changing its value. This may seem like a tough thing to do, but mastering this important skill is easy if you remember these three simple rules: find the complement, match the value, and add the complement. Attempt to identify the hue and then find the closest match you can on the color wheel..
You may either darken or lighten the complement color to match the value (tone) of your chosen color. Compare the two colors side by side. To make this process easier, take a tiny swipe of the complement color on your palette knife and hold it close to your chosen color. Finally, add a small amount of the modified complement color to your chosen color. This will not only mute your chosen color, but it will keep the value the same. The chart shows two different applications of this process. The blue to the left side is muted with its complementary orange. I matched the orange value to the blue by adding some black or burnt sienna. Then I add a tiny amount of the value-matched orange to the blue. As you can see, the final blue is about the same value as the old blue color. I have to match the value of the orange carefully as its value straight from the tube is lighter than the blue. Now let's use another color (red) as an example. I pick a complementary green and adjust its value to match the tone of the red on the left. I do so by adding a bit of white and black (you can also use burnt sienna). 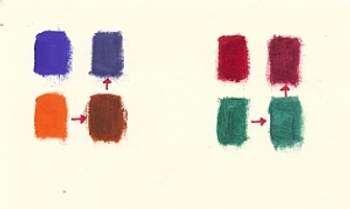 The process is not difficult, as the value of the green is closer to that of the red on the color wheel. This rule works well with all the colors except for yellow and violet--particularly darker yellows that have yellow ochre or burnt umber in them. Darker violets have problems, too. The reason? The earth tones tend to make violet look too brown (or warm) rather than making it grayer. I find it helpful, in order to correct the situation, to add French ultramarine blue (plus white if needed). To mute yellows, violets which contain red tend to produce a warmer yellow instead of a grayed yellow. As with dark violets, you can add a bit French ultramarine blue to counter the warm tone. In the case of graying very light violets, you can go ahead to use yellow. For this particular case, I have found that grays work better than yellow—as you can see from this picture below. In this illustration above, you can see that the violet grayed with a mixed black and white (with the same tone) is more intense than the violet grayed with yellow (on the right). You can see how the yellow makes the violet more brown, and the color intensity is lost. So, to control the color intensity, remember to use value-matched complementary colors to mute most colors. 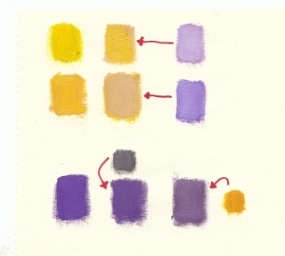 Use grays to change the color intensity of violets, and use blue/violet mixtures for yellows. You might find the mixing of the complement and matching the values a bit challenging at first. I sure did, but with practice, it gets easier and easier. There is more than just getting the right color- check the value(or tone). Here is the tool you would find helpful to gauge the value scale of a color.